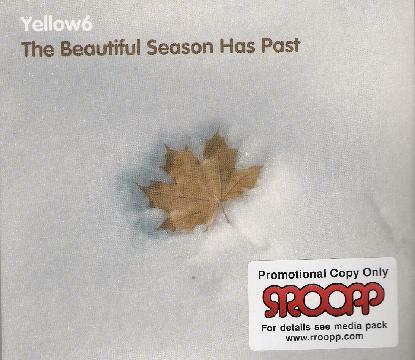 Yellow6 - "The Beautiful Season Has Past"
Just so you know what we are dealing with, this release is a 3-CD collection of out takes and un-released material from the body of work of Yellow 6, spanning the years between 1996 & 2004. Yellow 6 is a solo project by Englishman Jon Attwood, and could definitely be termed as an electronic excursion through ambience and all its subsequent aspects. Using electronics as a means of focus, this collection has everything that a sedative space head could ask for. The qualities of the tracks on these 3 CD's are surely enough ammunition to get truly meditated, and somewhat unconscious. To say laid back and mellow would be one way of putting it, repetitive yet exciting would be another, and throughout the 3 discs you definitely get a feel for what Yellow 6 is about. When I mention electronic ambience I hear all kinds of comparisons, ranging from Tangerine Dream to Brian Eno, Saturnia to Tortoise, as well as other more underground acts outside the mainstream. Think of the music as cinematic soundtrack stuff, floating rather than banging. Imagine that it is multi levelled, moving on different surfaces simultaneous, working different styles into collages of sound suited for headphones, if you can, you will be close to what the Yellow 6's sound actually is. The whole thing reminds me of Kyron, and other artists from the Black Note label, or what Graffiti 61 is experimenting around, so I know that Yellow 6 is not alone in his work. I also know that there are a vast number of bands attempting to do the noise experiment thing with poor results, as in they are not thinking through the end result very well. I can say that Yellow 6 shows that he has at least thought about his work, even if it is spontaneous, it still has an energy that shines amongst the bad bunch. As for each CD, they do not seem to vary much in style to one another; I mean that they are all in the same mould, in the same ethic. They all explore ambience in a certain way, but you could also say that there is a different flavour to each CD that is subtle and unhindered. In all they blend together as a nice little set of CD's for many an occasion of self hypnosis. Don't get me wrong there are tracks that you could stay awake to, just. But don't let that put you off. There is many an experience gained by strapping on headphones and leaning back and relaxing, and I assure you that Yellow 6 is one of those sound painters that will take you somewhere where you may not have been before. If you have been there, there is nothing stopping you from going there again. For more information you can visit the Yellow6 web site at: http://www.yellow6.com. Visit the Rroopp web site at: http://www.rroopp.com.